Adams Oshiomhole, national chairman of the All Progressives Congress (APC), has alleged that Samuel Ortom, governor of Benue state, deepened the circle of poverty in his state. Oshiomhole said this on Friday while addressing reporters at the APC headquarters in Abuja. The APC chairman, who did all within his powers to stop Ortom from defecting to the Peoples Democratic Party (PDP), said he felt relieved that the governor had left the ruling party. Oshiomhole accused Ortom of mismanaging bailout fund and Paris Club refund he got. He said the governor refused to pay salaries and made the people go through hardship. He said APC would have lost Benue if it fielded the governor in 2019, adding that the search was on to get a credible candidate for the next election. “The APC in Benue state is relieved. I am relieved that Ortom has joined the club he actually belongs to. A club whose primary philosophy is to share the money, not to develop the communities. We now have a clean platform to look and search for a credible Benue citizen that can provide the kind of leadership that the great people of Benue deserve, not someone that seeks to make capital out of human graves and celebrate the death of his own people,” he said. “As a party, we condemn any life that has been wasted by criminals whether in Benue state or any part of Nigeria. From the point of view of our leaders in Benue state, their position was clear that they do not believe fielding Governor Ortom on the APC platform in 2019 election can only lead to electoral defeat for a number of reasons . “They reminded us that in spite of the allocation accruing to Benue and in spite of the bailout funds amounting to over N20 billion that he has received in two installments of N10 billion each and in addition to the huge sum of money Benue state collected from Paris Club refund, Governor Ortom has not and is not paying salary to Benue workers as and when due. 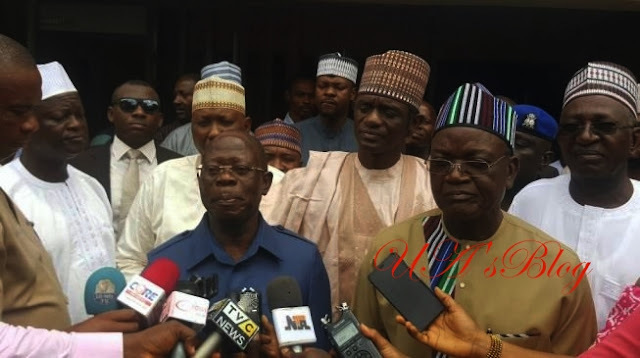 Oshiomhole said one of the reasons Ortom fell out with the leadership of the party in Benue was his close allies were allegedly involved in the killings in the state. “They draw our attention to the fact that Governor Ortom has complicated the killings by his own action and poor judgement,” he said. “Some of those who have been arrested in respect of killings in Benue, were people who have been associated with Governor Ortom, including people who have been in his employ. The APC chairman accused the governor of playing ethnic card to worsen the crisis in the state. He added that the governor became the candidate of the APC in the 2015 election by accident. “He actually got our ticket on a platter of gold and he was never a participant in the during the formation of our party. He became a candidate by accident and lesson to learn from our party is that never again people should become a candidate on our party platform by accident,” he said.